Italian prop Martin Castrogiovanni is a bit of a character to say the least. It has emerged that his reason given for missing Racing Metro’s Champions Cup semi-final win over Leicester didn’t really add up. 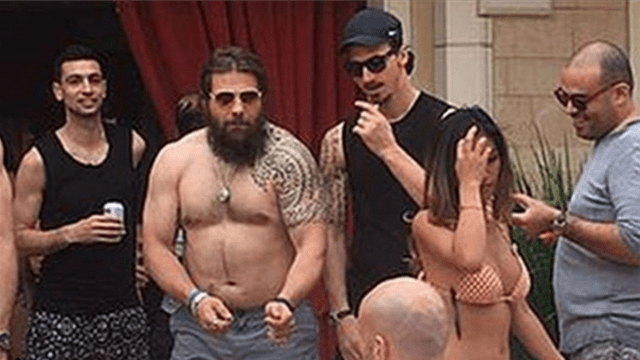 Castrogiovanni had told his employers that he needed to return to South America for personal reasons, however, when images of him partying with PSG players in Las Vegas emerged it became clear that all was not as it seemed. This photo of the prop at what appears to be a Vegas pool party has prompted a statement from his employers. Following the publication of photographs in the media today showing Martin Castrogiovanni in the company of Paris Saint-Germain footballers [last] weekend at a hotel in Las Vegas, while the entire membership of the club was in Nottingham to play a semi-final of the European Cup, Racing 92 has decided to suspend the player and to launch a legal procedure. As daft as he is, you do have to admire the balls of someone to miss a semi final to go partying in Vegas, knowing he probably would be seen.